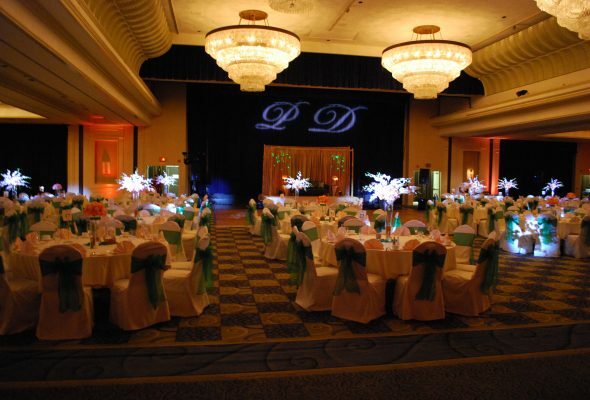 Dhamaka Entertainment team has been providing DJ services in California for over 20 years. 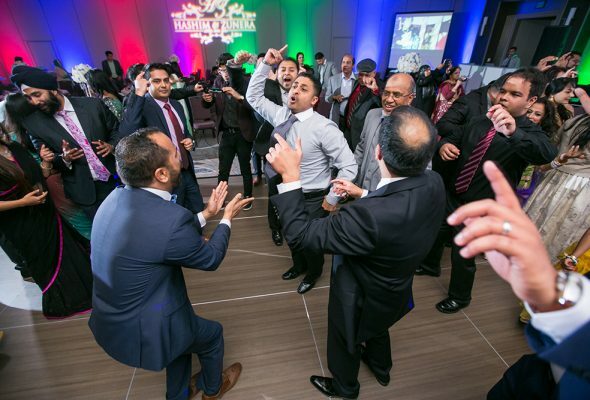 Our talented DJ’s entertain any type of crowed for any occasion with variety of music selection such as Bollywood, bhangra, tamil, telegu, gujrati, hip hop, latin, 70’s & 80’s, etc. And our MC’s keep your party hyped and going all night. We also provide state of the art sound system for small parties to big concert. Want more excitement and fun for Baraat? 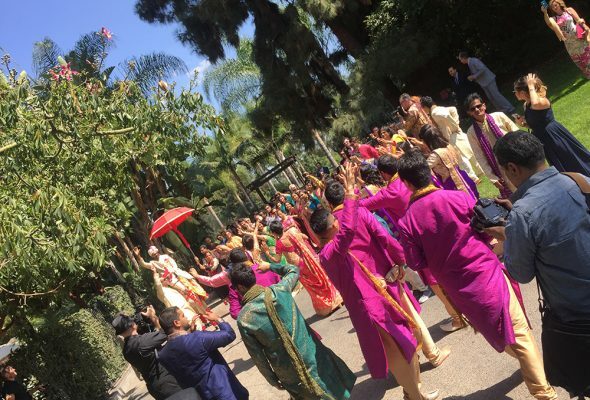 Dhamaka Entertainment is the first Dj company to provide full powered music for the Baraat / Jaan in west coast. Dhamaka Dj’s mix wedding related and popular up-beat music for the baraat procession which gets baraat more energizing and exciting. Dhamaka Entertainment has a custom designed mobile Dj equipment which could basically be maneuvered anywhere without interference. Imagine your Baraat procession or grand entrance, mehendi or sangeet night with powerful beat produced by our dhol player. We also provide dancers to motivate your guests and create more excitement. Dhamaka Entertainment has actively entertained hundreds of marriage ceremonies, from traditional hindu ceremonies to modern fusion weddings. 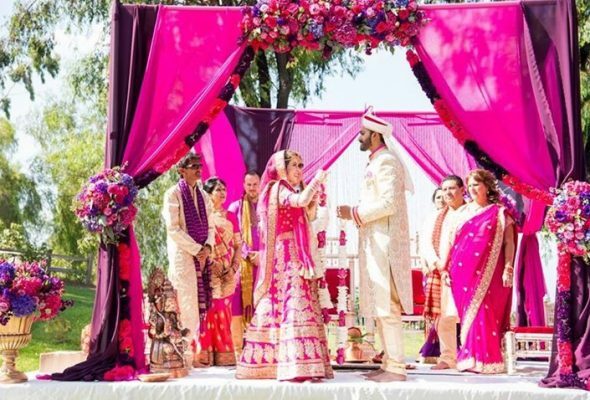 With our experience and knowledge of different regional music we are able to coordinate music to different parts of ceremony, ie – for brides entrance song to ceremony hall, to melodic Shehnai, Tabla & Sitar music on the background during the ceremony, to the bidai songs. Our state of the art projection for any venue. We provide different sizes of screens with different kinds of projection from 3000 lumes to high definition projectors which produces quality providing bright, crystal clear images for your presentation. 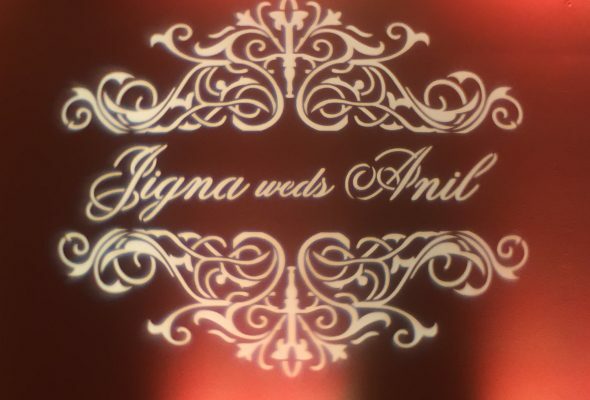 Digital picture taken during the engagement, sangeet, mehendi, garba nite, phithi or wedding ceremony are then projected on the screens as guests enter the ballroom / hall and enjoying the cocktail. Live projection of the grand entrance, stage ceremony, speech, performance or the hole event providing the guests visibility of important events. The simulcast is 100% live with absolutely no delay. Montage, as you display your personal slideshow made up of memories of childhood to the present day. Your unique and custom made slideshow will become the highlights of the evening. A custom monogram is the perfect finishing to an elegant wedding. 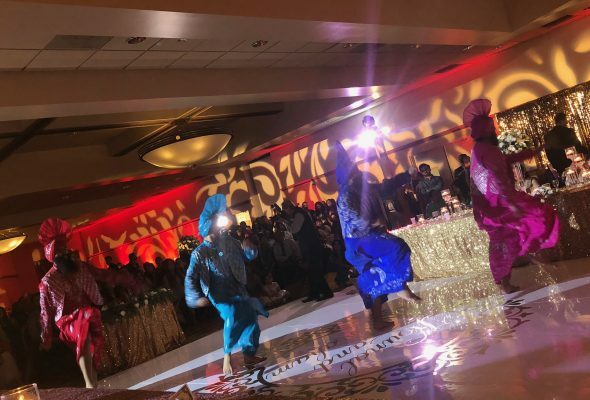 Dhamaka Entertainment can customize any kind of logo or monogram you can think of and will be projected on the dance floor, wall, above the cake table or sweet heart table. 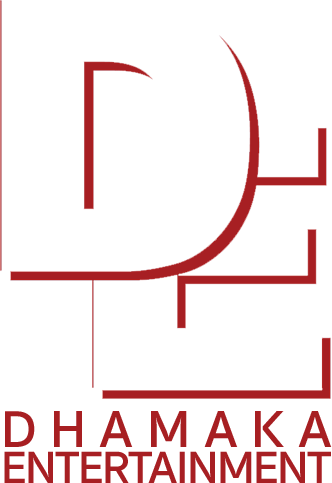 We can design monogram with your initials, names, images or patterns you imagine. Monograms will create unique, elegant and lasting impression. Energy efficient and dynamic. 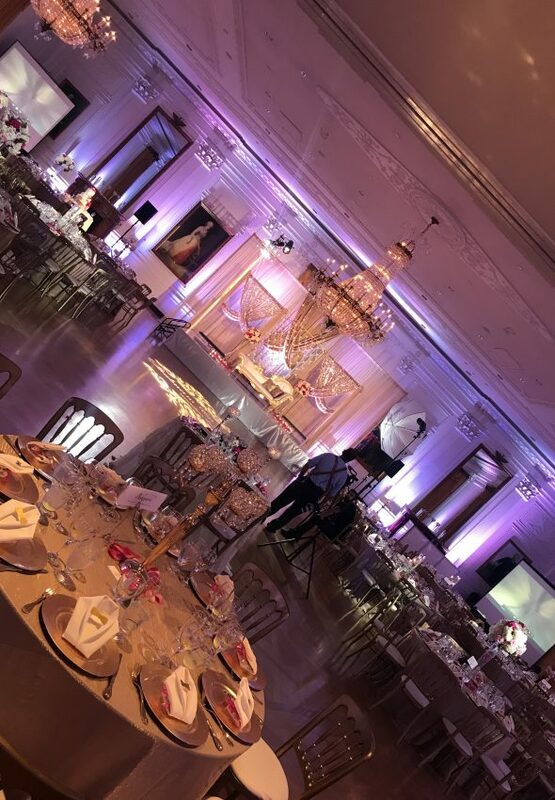 LED lights are the new technology that magically transforms the ballroom from pink to a sky blue in mere seconds, the use of hi-tech lighting options that put us on the cutting edge of lighting Technology. 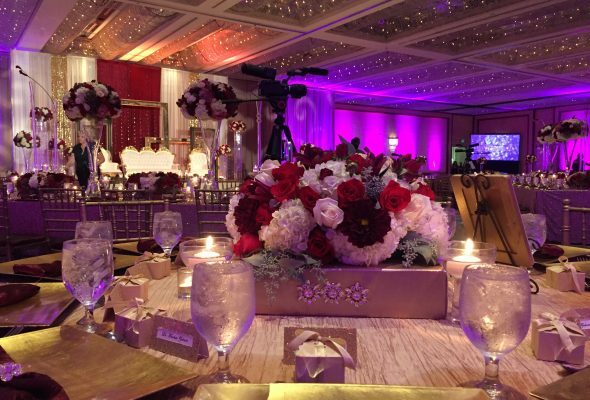 By utilizing this technology, we have the ability to create unlimited color mixing and we are able to match your events theme. We can program the lights to slowly change colors simultaneously throughout the event to give the appeal of shifting mood and atmosphere. There is no better way to make your dream event memorable then using LED high-tech lighting provided by Dhamaka Entertainment. 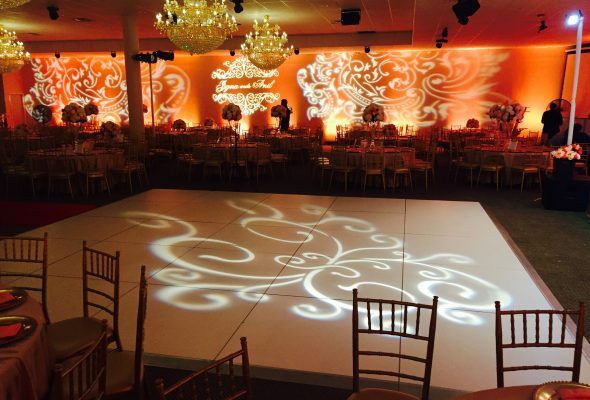 Keeping with our values of innovation and decorating your events with pattern light is a modern and simplistic way to accent your style with the use of theatrical features.